The recent revelation of the Palestinian mindset changing from a silent majority of peace loving Arabs held hostage in a cycle of conflict with Israel by an internal radical terrorist fringe, into an all out terror worshiping nation had its roots in four major blunders. Many world leaders are turning a blind eye or trying to ignore this by other means, and therefore they have no hope to pinpoint these issues. The better international leaders, such as President Bush, are aware of the problems, but they have bigger issues demanding their priority, and so a full review of these issues never gets added to the sum of what Western Foreign Policy should be in the Middle-East. But I have the luxury of speaking of Utopian ideals, so I intend to, and hope that others will do likewise. My one goal in this blog is merely to guide a discussion in methods to seek a fair and conclusive end to violence and fulfill International Law without treading upon the Religious Freedom of the Jewish People. Someone with the courage to stand tall to opposition needs to speak up or else someone who is sufficiently insignificant enough to not get any opposition needs to speak up. I am such a man. Such a person would be willing to face the plain truth of things and offer a solution to avoid the end which the incredibly poor choices and actions of the Palestinians currently beg for. Only by addressing these major moral issues within their national psyche can the Palestinian Arabs have hope to regain their lost right of a homeland. A right lost by the weight of their own transgressions. Of course they never had a right to have that homeland with Jerusalem as their capital but that is a discussion best left for another blog-post on another day. 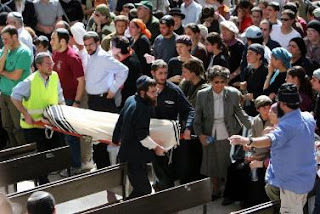 As Reported in the Jerusalem Post, according to a NY Times Poll, 84% of Palestinians approve of the slaughter of the innocent, peace loving youths at the Mercaz HaRav Yeshiva. While one should not hastily decide the fate of an entire people based on the results of a single poll, the horror of recent times and the collective body of evidence points to one thing, the fact that the dream of Palestinian Statehood West of the Jordan has come to an end. It is a dream I must confess that I too dreamt. Imagine… Israel performing charity that no nation would have seriously even considered attempting… ( …for themselves… even though they have tried to force it down Israel’s throat). Only in an act of pure kindness and charity could Israel hope to give up an inch of God’s Land without desecrating His Holy Name. Yet, every government involved in the peace processes over the years has fought against spirituality. Fought against kindness for its own sake; fought against fair homage to the Faith and history of Israel, for they, and the faithless leaders of Israel included, had no respect for any of it. Instead new morals were created. A hodgepodge synthesis of their best estimation of what fair play is under these circumstances or that. Who has cursed the Palestinians even as Israel and the West has tried to aid them? What is the culprit of the fall of the Palestinian Dream? Nothing other than their own lack of morality! Palestinians have proven themselves willing to ignore any evil they do, and in fact, now they rejoice over the evil they do. They are willing to ignore any good Israel does. Since the 1970s they followed Arafat’s bad advice and rejected Israel’s offered hand of friendship. And the moment President Bush grants them $150 million even as the USA suffers a national financial set back, the Palestinians go completely barbaric in their near unanimous joyful support for the slaughter of the innocent. No respect for their benefactors, beginning with the Almighty, and not a drop of gratitude for anyone. They have collectively forsaken both common decency and the rule of law, and therefore no nation can be expected to make peace with them. They have proven that they do not understand the meaning of objective peace, nor of objective truth. I said twenty years ago that Kahane was wrong, but the Palestinians have elected him to be right. But if twenty years ago Kahane was indeed wrong, he was not evil incarnate. The failed leaders of Labor and Kadima branded Kahane an anti-messiah, and the arch-terrorist Arafat a man of peace. Twenty years of lies as foreign policy later, Olmert, Sharon, Rabin, Barak and Peres all seem cruelly detached from reality and the needs of both peoples involved. I cannot blame the American Presidents involved when the leaders on the scene were so perversely wrong. Twenty years ago most people thought Meir Kahane’s plans were racist. Now they seem more compassionate than the legacy of continual violence and death that the Oslo accords have brought us. Kahane wanted to pay money to Palestinians to relocate abroad. How many lives on both sides, especially among the Palestinians, would have been saved had we listened to him? Who advocates for the Gypsies of Europe? Who mourns the divided Kurds of Mesopotamia? How then shall any person or nation continue to hold high the goblet of Palestinian Arabic independence in the face of their dastard inhumanity? To reward a nation such as this with a state at this point in time would be to perpetuate all that is wrong in International Politics today. If the Palestinian Entity is considered a full fledged legal state, and at this stage they are not. Any attempt to give them territory would fall under the rules of Cession (explained well in Shaw, 1997, Pp 339 & following). This would require the Palestinians to respect third party rights to the land (such as Jewish rights to the visit the graves of their ancestors without danger). The fact that the Palestinians have yet to show that they would respect International legal rights of the Jews in their midst if Israel were to fully withdraw from the West Bank, makes it foolish and immoral to consider such a withdrawal, and illegal to implement such a withdrawal. If the Palestinian Entity is a nonstate organization, and at this stage, they are. Any attempt to give them land would fall under the rules of Succession. (Shaw, 1997, Pg 930) And that would mean that Israel would need to fully consider the rights of the owners of the religious sites in question. As the State of Israel never annexed sites such as the Cave of the Patriarchs in Hebron, and they preserved the rights of Jews to practice ritual and dwell near the Holy Sites of the West Bank, they have defacto declared the Jews of the West Bank as the rightful owners/representatives of these Holy Sites. Therefore any attempt to surrender West Bank Holy Sites, would require some sort of binding referendum of the Israelis in the West Bank as to the future of the Holy Sites. This is not the case with East Jerusalem, which in its entirety, including all its Holy Sites has been annexed already by Israel. If however, Israel's government would reject its ownership of the East Jerusalem Holy Sites, it would require two referendums. One of Jews within the Green Line, and only if the Jews forsake their religious rights would it make sense to bother with a full referendum of all Israelis, Jew and Gentile alike, to seek political permit of any transfer. If, however, indeed the very freedom of religion for the Jewish People realistically depends on their possession of all their Holy Sites, then they cannot choose to surrender that which they must have. Primal law trumps political expediency every time. The Jews of Israel can't depend on the government to protect them. As the holy sages of the Talmud say in Sotah, "Upon whom can we rely? We can only rely upon our Father in Heaven." Divided lunch schedule, only 50% of the students are in the lunch room at any one time. Hashem will help us! Fear only Him. The massacre will not likely affect the secular government, but it can and should affect the Torah world. An end to Shas party participation in the Olmert government. The time for new leadership has long since arrived. A weekly prayer rally gathering in Yerushalayim/Jerusalem that Hashem should have mercy and send us moshiach tzidkenu/our righteous messiah, as soon as possible. Hashem will help us! Fear only Him!